First of all, this is NOT gumbo. This is nowhere near gumbo. I've even eaten vegetarian gumbo that tasted more like gumbo than this. This recipe is nothing more than a vegetable-bean soup. Tomatoes, celery, bell peppers, kidney beans, onions, and a whole lotta vegetable stock...too much I think. This "gumbo" wasn't even thick and stew-like; it was very soupy. Most of the flavor aside from the veggies came only from thyme and file powder, which I definitely thought gave gumbo its gumbo flavor. I guess not. Aside from all my complaining about this recipe, it was healthy (although surprisingly high in sodium), filling, and tasty. Served over rice, it becomes more of a veggie-bean-rice soup, but that was OK. The serving portion (about 12 oz.) was rather large, but it will definitely keep you satisfied. In conclusion, this was not an outstanding recipe, in flavor or ingredients. It was very average...but I have to praise it for being simple and filling. Make again? Probably not, if I'm trying to make a TRUE gumbo recipe. 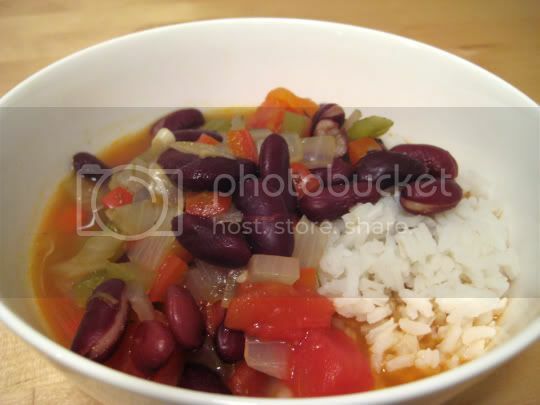 "Ravishing Red Bean Gumbo," The Vegetarian Meat and Potatoes Cookbook, Robin Robertson. Boston: Harvard Common Press, 2002.